1. Soft tissue injury – The flap that the dentist raised ( cut so that the he can visualize and access to the embedded wisdom tooth) might be tear off during the procedure,it might be due to inadequate size of the flap or he uses excessive force to retract the flap. To manage it, the clinician will smoothen the edges and suture back the flap. The rotating bur that the dentist uses to remove bone to allow removal of your wisdom tooth might injures your lips or any soft tissues if he is not careful. If it happens, Vaseline or any antibiotic ointment can be applied to cool that area and it can heal around 5 to 10 days time.To prevent any scarring or to decrease healing time, you can keep the injured area moist. 2. Tooth that is being removed: Sometimes, during the process of wisdom tooth, that tooth itself or its fragments might drop into our oropharynx and a xray have to be taken to locate where is the tooth. Retrieval can be done through bronchscope. Fracture of the adjacent tooth restoration: If there is a huge restoration next to your wisdom tooth, there might be a consequence that it can be fractured off. The clinican will be careful when removing your third molar, but sometimes accidents do happen. What they can do is placing a temporary restoration on the place where restoration is fractured off and set an appointment to fill it back another time. Luxation of the next tooth: Using excessive force might cause the next tooth to be loosen/luxated as well especially when there is crowding at that area. If this situation really happens, what the dentist will do is reposition the tooth into its position and stabilise it . 4. Fracture of alveolar process: Our alveolar bone might be fracture when not adequate support is given.If this occurs, the dentist will smoothen any sharp bony edges and suture flap over it to prevent delay of healing. 5. 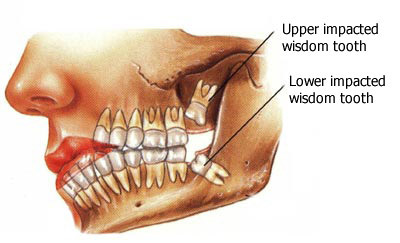 Injuries to adjacent structures: Nerves might get injured in extraction of wisdom tooth and temperomandibular joint might also get injured and application of moist heat, plenty of rest and soft diet can be done to manage this problem. 6. Infection : Infection might occur as removal of bone and reflection of flap is done during removal of wisdom tooth. That’s why dentist use a lot of irrigation(spraying saline using disposable syringe) to prevent infection. Antibiotics is to be taken to prevent infection too. 7. Dry socket : You will feel very painful and it might radiate to your ear. You will feel bad taste and this is due to delayed healing . The cause of dry socket is not clear but it might be due to high fibrinolytic activity that causes lysis(breakdown) of the clot that is formed before this causing delaying of healing. To manage this, the dentist will first irrigate that area and pack some medication into it. Iodoform pack consists of eugenol which obtunds the pain, benzocaine ,a topical anaesthesia which you have to change everyday until the day you don’t feel pain anymore because it might delay healingof the socket. 8. Pain: Peak pain occurs about 12 hours after extraction and you can take some medications prescribed by your dentist to relief the pain. 9. Swelling: Swelling is common after wisdom tooth removal as removal of bone takes place. Ice packs can be placed for 20 mins and have plenty of rest. Nothing should be done on the second day after extraction and heat pads can be placed on that area on 3rd day to ease the swelling. 10. Trismus : Trismus which is inability to open the mouth might occur after extraction. It might be due to injection too much of local anaesthesia or the injection penetrates the muscles . What you can do to ease this is apply some moist heat/ warm cloth on that area. Infection might be another cause for prolong healing and you should report to your dentist about it. 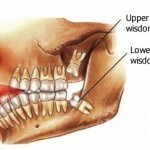 Complications might arise after wisdom tooth extraction and post operative care is important. Remember do monitor the healing process but do not be too overwhelmed. If anything abnormal occurs, please do report to your dentist about your condition to prevent any further complications to take place. What are the complications of tooth extraction?